We’d love your help. 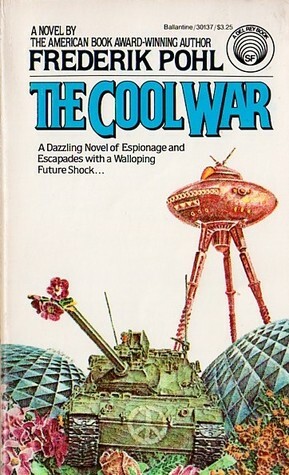 Let us know what’s wrong with this preview of The Cool War by Frederik Pohl. Fred Pohl, multiple winner of science-fiction's top awards, presents a breathtaking romp through the energy-poor world of the 2020s - a gripping chase-intrigue novel with a highly unlikely stand-in for James Bond. One day, the Reverend Hornswell Hake had nothing worse to contend with than the customary power shortages and his routine pastoral chores, such as counseling the Fred Pohl, multiple winner of science-fiction's top awards, presents a breathtaking romp through the energy-poor world of the 2020s - a gripping chase-intrigue novel with a highly unlikely stand-in for James Bond. One day, the Reverend Hornswell Hake had nothing worse to contend with than the customary power shortages and his routine pastoral chores, such as counseling the vivacious Alys Brant - and her husbands and wife. At nearly forty, his life was placid, almost humdrum. The very next day, Horny Hake was first enlisted as an unwilling agent of the Team - secret successor to the long-discredited CIA - and then courted by an anti-Team underground group. In practically no time at all, Horny and Alys were touring Europe on a mission about which he knew zip, except that it was a new move in the Cool War, the worldwide campaign of sabotage that had replaced actual combat. *And Pegleg, master of such lethal toys as the Bulgarian Brolly and the Peruvian Pen. To ask other readers questions about The Cool War, please sign up. I got a pristine hardback copy of this in the 1990s for 3 dollars because it was in some cut-out bin at a used book shop that I liked. I recall enjoying it a lot. It's an amusing take on cold war, with some fun ideas. But, alas, I read it so long ago that I can't vouch for it much in terms of style or what have you, except that I do remember the episodes made me chuckle. I haven't read any of the author's other works. But, this one was a muddled and meandering story-- sort of a mash-up, or a futuristic spy farce. I would say that as I read I had to check the copyright date a few times, because some of his material was as current as today's news. This novel inhabits that strange satirical world populated by other works such as perhaps On Her Majesty's Occult Service or Modesty Blaise serials and even The Loo Sanction or maybe even Catch-22. Pohl does not pull his punches, and so absurdity has a backbone to it. This is good for a light read, though it is quite dated. For a book written in the 1980s (set in the 2020s), it seems to mispredict a lot about communications and politics. One plot point depends on how the main character will reveal his findings to the world before the government silences him. In the age of Wikileaks and YouTube, it should be a trivial effort at best. Computers are rare and a library search engine is treated as a new technological marvel. Everyone still uses typewriters and tape This is good for a light read, though it is quite dated. For a book written in the 1980s (set in the 2020s), it seems to mispredict a lot about communications and politics. One plot point depends on how the main character will reveal his findings to the world before the government silences him. In the age of Wikileaks and YouTube, it should be a trivial effort at best. Computers are rare and a library search engine is treated as a new technological marvel. Everyone still uses typewriters and tapes. The Soviet Union and Yugoslavia still exist. No one has cell phones. Ordinarily, I wouldn't harp on these things so much, but near-future novels date badly, and the widespread use of computers should have been apparent. After all, early mass-market gaming systems (which are merely specialized computers) such as the Atari 2600 existed, and the Altair 8800 was around in the 1970s. When the plot involves secrecy and communications, it can fall flat when it does not match up with reality. I can forgive H Beam Piper and his slide rules in space because it was the 1950s and computers were primitive and unwieldy. To miss that concept in the 1980s is just shortsighted. The actual plot is about a somewhat apathetic Unitarian minister (he says he has not considered the possibility of God existing despite his profession) named Hornswell "Horny" Hake being drafted into the "Team", which is the CIA's successor agency. Yes, women are attracted to him, and the obligatory jokes are here. Hake is unwittingly sent on missions to sabotage even nations that are friendly to America, since politics is about having a slight edge rather than a decisive military victory. No one wants to fight a war after Israel nuked Arabia's oil fields, so everyone just engages in petty vandalism missions. Hence the name "Cool War". Due to oil shortages, America has strictly rationed electricity, and the characters comment on "power piggery". Hake spreads viruses through deliveries of marmosets to schools, and accidentally tracks the Team's enemies through a bracelet he thought indicated sexual availability. Hake finally tries to help the other side as much as possible after he finds out he has been lied to, and he tries to stop the Team from sabotaging solar power in a fictional Arab country. He then reveals the Team's secrets to the world, and hopefully ends the Cool War. It's interesting that this book has a NON-Trinitarian Christian fundamentalist as a major character (Jasper). No, Jasper is not a Jehovah's Witness. In fact, he would take major issue with the Witnesses' position of staying out of politics! :) Jasper believes in God and country, and will argue with anyone who questions the Team's atrocities. At least some concepts of the Cool War exist today in the form of hacking and other electronic sabotage, especially in regards to Chinese scandals in the news. Electricity usage meters and windmills are becoming more common as well. For all Pohl gets wrong, you can see parallels with the modern world. This book will also give you a few smiles. Not major laughs, just smiles. As a final note, who would let a religious figure named HORNY around a bunch of children today? In How Not To Write A Novel, the authors note that a pastor should not drag a child character out of a burning building due to modern suspicions! Continuing my lifelong interest in pulp sci fi, I found this beat-up paperback at a place where I volunteer and knew by it's garish 70s cover and not-so-clever title that I was in luck (I found another that I will review later). I've read a few of Pohl's books, he was a very prolific writer and my hometown's library had many of them, and most of them are better quality than a lot of pulp sci fi and a few are quite good, even great. This one, though, has an almost incoherent plot, unbelievable cha Continuing my lifelong interest in pulp sci fi, I found this beat-up paperback at a place where I volunteer and knew by it's garish 70s cover and not-so-clever title that I was in luck (I found another that I will review later). I've read a few of Pohl's books, he was a very prolific writer and my hometown's library had many of them, and most of them are better quality than a lot of pulp sci fi and a few are quite good, even great. This one, though, has an almost incoherent plot, unbelievable characters, and a breakneck pace that combine for a thoroughly disorienting read. It's not totally unenjoyable, especially if you have a soft spot for "bad" bits of media, and I derived some pleasure from shouting out "What?" to myself in an incredulous voice at numerous points in the short novel. Loosely following the adventures of a Unitarian preacher Hornswell Hake, who is refered to as "Horny" throughout the book, as he is drafted into a series of secret governmental agencies that are fighting a 'cool war' in a somewhat dystopian future. In the book's cleverest touch the 'cool war' is basically a war of annoyance fought by the Eastern and Western blocs in an attempt to make life less pleasent for the other side. This involves spreading virulent lily pads that clog up water treatment systems and other ridiculous plans that nudge the book towards a satire of cold war politics. (As it is the future there are also group marriages, wacky technologies, and resource rationing.) Horny bumbles about, not really understanding why he's doing anything or whom he's working for, and his perpetual state of confusion matches the readers' as the characters join into a jumble of changing names, allegiances, and random sexual encounters. (I did really enjoy the constant callbacks to his small new jersey congregation where he plans singles mixers, though.) Part spy thriller, part farcical comedy, and part sci fi satire, it's a weird book and I am somewhat happy to have read it, although I'll probably never get a chance to discuss it with anyone else. I like Frederik Pohl, but by his standards, this book was pretty lightweight. It's set in the not-too-distant future where there is a "cool war" between East and West. In it, the spies merely try to irritate each other in order to sow chaos. Amusing, but just barely. Hornswell Hake, a Unitarian minister referred to as "Horny" throughout the book, is recruited by the Team, the post-CIA spy agency, to unwittingly create chaotic events throughout the world in travels they send him on. Sadly, he's a I like Frederik Pohl, but by his standards, this book was pretty lightweight. It's set in the not-too-distant future where there is a "cool war" between East and West. In it, the spies merely try to irritate each other in order to sow chaos. Amusing, but just barely. Hornswell Hake, a Unitarian minister referred to as "Horny" throughout the book, is recruited by the Team, the post-CIA spy agency, to unwittingly create chaotic events throughout the world in travels they send him on. Sadly, he's a bit of a bumbling fool, constantly being played by either the Team or their enemies, who also try to recruit him to their side to fight the Team. There's a great bit of irony in the book and some good laughs too, but here are just some head scratching moments. Case in point: Horny and a parishioner named Alys (who is married to two men and a woman) are searching the Middle East for one of Horny's opposites, a woman he's got a thing for named Leota, who has been taken captive by a Mid East sheik to be in his harem. Horny and Alys travel through the desert to this sheik's place and spot Leota outside. There, instead of grabbing her and fleeing, Alys decides to exchange places with Leota, apparently because she thinks it a bit romantic, as well as the fact that she thinks she's better with men. Huh? They changed clothes with each other and then Horny and Leota take off while Alys stays. Pretty hard to believe, even if it is a sci fi novel. I got introduced to Pohl by reading Gateway (1977) (winner of the Hugo Award and Nebula Award). I went on to read Beyond the Blue Event Horizon (1980), Heechee Rendezvous (1984), and Annals of the Heechee (1987). It is a great series, right up there with Foundation, Dune, and Dickson's Childe Cycle. The Cool War, is written as well as these other books, but the premise is a little shaky. The premise being that there are factions that are trying to advance their country not by making progress wit I got introduced to Pohl by reading Gateway (1977) (winner of the Hugo Award and Nebula Award). I went on to read Beyond the Blue Event Horizon (1980), Heechee Rendezvous (1984), and Annals of the Heechee (1987). It is a great series, right up there with Foundation, Dune, and Dickson's Childe Cycle. The Cool War, is written as well as these other books, but the premise is a little shaky. The premise being that there are factions that are trying to advance their country not by making progress within the country, but by pulling down the other guys. From the aspect of an adolescent, or someone with an eighty IQ it might seem plausible. Our protagonist, Rev. Horny Hake, gets sucked into one of these groups--he's called up from the military reserves, threatened with jail time if he doesn't join up and is giving some positive benefits as well. On his first mission he unwittingly helps with one of these plans. The group seems to be part of the government, so he doesn't really have any recourse. There is a "rebel" group that is trying to stop them, and confront Horny with the facts. Obviously he doesn't want to be a part of starting some crop failure in Europe, or disabling a solar powered electrical power plant. the idea of a cool war as apposed to an active or hot war as well as a passive or cold war the cool war is one of harassment and annoyance of the citizenry of a rival nation making their lives uncomfortable and annoying them etc.. sound familiar? hypnosis and cognitive state what is normal behavior? Not Pohl's best, but it was an interesting look at war without all the bloodshed; I wouldn't doubt many of the things happening today are the result of this sort of behind-the-scenes activity. The book does place high on the deceptive cover list, though, as there's not a darn thing in this book that resembles what happening on the cover. Visit to a time where sabotage has replaced the old fashioned kind of war. Written in the 1970's, set in 2020, we are rapidly catching up. For better or worse, Pohl's vision of 2020 appears to me to be more on target than Orwell's 1984. Among Pohl's worst. I did like the concept of a war in which nations try to irritate each other the most. Not the best Pohl story: an interesting idea, but the story arc is a little rough and the ending was more abrupt and less conclusive than I preferred. A sci-fi relic, dystopian and morally shocking in its day but overtaken by events and now merely curious. It was well written and an interesting setup, but I kept waiting for something neat to happen...and then the book ended. Frederik George Pohl, Jr. was an American science fiction writer, editor and fan, with a career spanning over seventy years. From about 1959 until 1969, Pohl edited Galaxy magazine and its sister magazine IF winning the Hugo for IF three years in a row. His writing also won him three Hugos and multiple Nebula Awards. He became a Nebula Grand Master in 1993.